Recruit participants for your surveys, interviews, and any other research studies the smart way. What is a study page? The Study Page is an advert for your research study on the Call for Participants platform. It puts your research in front of thousands of potential participants from around the world visiting the CfP platform daily. The Study Page puts your researchers in front of the thousands of potential participants visiting Call for Participants. 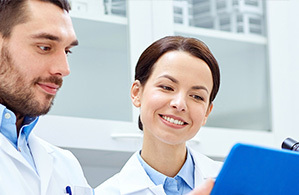 Visitors can self-select into participating in your research provided they meet your recruitment requirements. When you publish your Study Page, we will send a notification email to matching people in our signed-up participant pool. The Study Page is great for recruitment online. But what if you want to advertise around your university or home town? 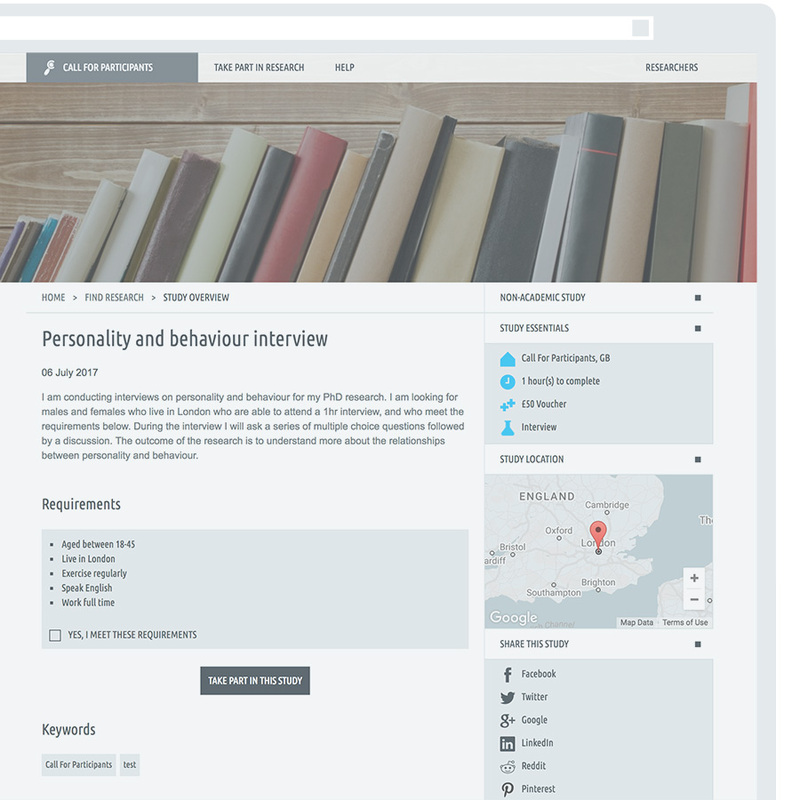 Not a problem - with a single click, you can turn your Study Page into a beautifully designed recruitment poster. The poster also includes key info like print and expiry date, making easy for people managing notice-boards to know when it is okay to take your poster down or when to keep it up. Tear-off tags with trackable codes make it easy for people to get to your Study Page and take part. 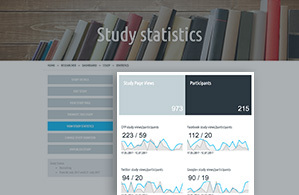 If you use our promotion tools for posting your Study Page on social media or sharing via email, we will provide traffic and participation statistics from each place where you promote your study. This way you can see exactly where the participants for your study are coming from and focus your recruitment efforts on where they work best. Call for Participants is integrated with all major social media sites. Helpful tips from our staff teach you how to maximise your promotion on these platforms and recruit all the people you need. Age, gender, or any other requirement is shown on your Study Page so potential participants exactly who is needed for the study, giving you the demographic you need. We are here to make life easier. All of our services are designed to be quick and easy to use. If your institution permits it, give us rights to promote your study on your behalf and every study will be posted on our social media channels to expose it to relevant audiences. A special preview link allows you to see and send your Study Page to your supervisor or ethics committee before it is publicly available. This way, they can review and provide feedback before you start recruitment. You have two options for conducting your research. You can provide a link where participants are sent to - perfect for online surveys or scheduling tools. 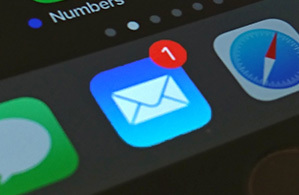 Alternatively, you can choose to be forwarded participants' contact details. If you get into trouble, know that you are in good hands with our helpful staff always on hand via live-chat. Study Page makes it easy for participants to get all the information they need about your study including completion time, compensation for their time, type of study, and requirements to partake. We do not have access to your participants' responses and we don’t share any participant data with 3rd parties. Our dedicated Help Centre provides answers to questions, quick start guides, and everything you need to get started with CfP. 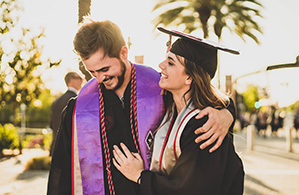 We understand the importance of ethics and go to great lengths to assist you in conducting ethical research, as well as displaying ethics approval information on your Study Page. Taking your recruitment to the next level is easy, why not do it now. Hear from Dr Ian A Clark from UCL who used Call for Participants for recruiting participants for examining memory and its origins. Put your university email address into the field below and get a quick license check to see if you are covered. 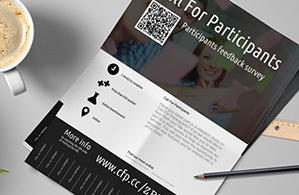 *Participation is considered successful when we send you the participant's contact details or when the participant is directed to your survey link, depending on the settings you specify.